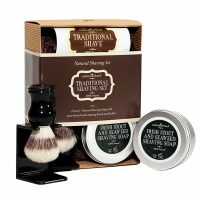 A traditional Shaving Gift Set for Christmas that will make a lasting impression all through 2019. For the gentlemen who enjoys a close, comfortable shave using a traditional shaving brush with a pure natural shaving soap. The ingredients are pure and guaranteed free of artificial chemicals and fragrances and the brush is made from natural boar bristle.